/INS. 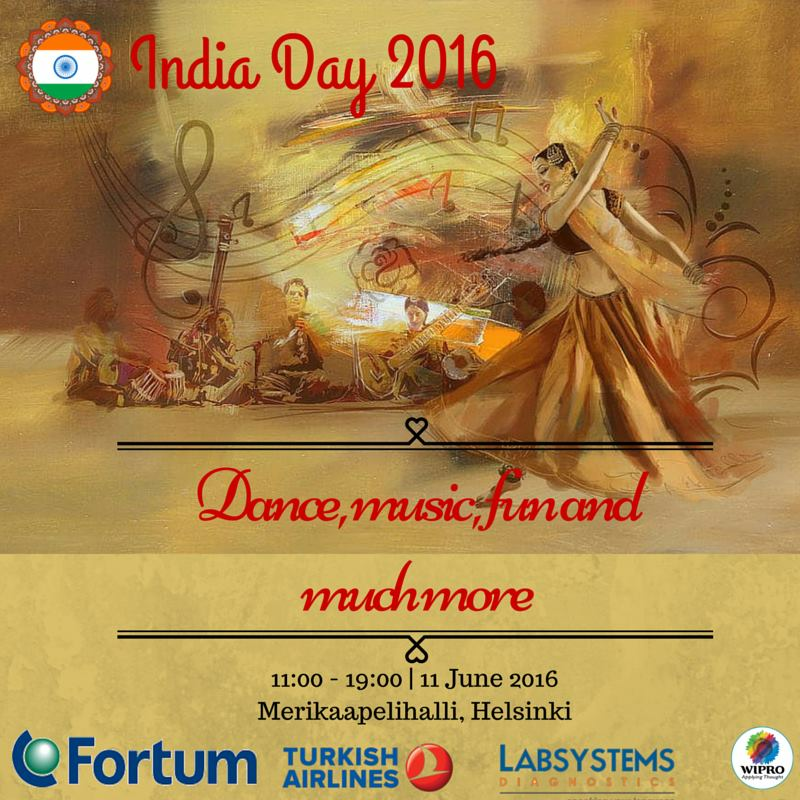 Finnish-Indian Society, along with other regional associations in collaboration with Embassy of India to Finland and Estonia, are hosting the first ever India Day on Saturday June 11th, 2016 at Merikaapelihalli, Helsinki (Tallberginkatu 1, 00180 Helsinki). India Day 2016 will provide a platform to showcase rich Indian culture, heritage and tourism to all communities and Finland residents. This event is suitable for all age groups. The program of the event includes singing, Classical dances, Bollywood dances and Musical plays. Among the performers is Tuomas Kantelinen. Close to 100 artists will be on stage during India day. Regional associations and professional dancers from various dance schools in Finland will perform. The visitors can experience classical dance forms from nearly all the regions of India to reflect India’s diverse culture & traditions on stage. India has a rich and varied textile heritage, where each region of India has its own native dress & traditional costumes. India day will include an Ethnic fashion show to showcase beautiful costumes from different states of India. Childrens’ program includes art workshops where kids can practice the famous Madhubani sketching and coloring. Indian themed tents will showcase storytelling, theatre and puppet theatre programs by professional artists. Several food stalls will offer a wide variety of Indian delicacies available from various regions of India. Indian handicrafts, jewelry and spices will be on display and available to purchase. Visitors will have the opportunity to visit Ayurveda specialists and Henna tattoo artists. The India Day 2016 venue Merikaapelihalli, Helsinki (Tallberginkatu 1, 00180 Helsinki) has a capacity of more than 3000 persons. Everyone interested in India, Indian Culture & Heritage, Indian Cuisine and Tourism is welcome to the event.